There’s nothing unusual about a bride-to-be in a wheelchair shopping for her perfect dress, but it’s extremely rare that you walk by a shop and see differently-abled mannequins in the window. A bridal store in England is gaining praise online for its inclusive display, which includes a mannequin in a wheelchair wearing one of the store’s stunning gowns. 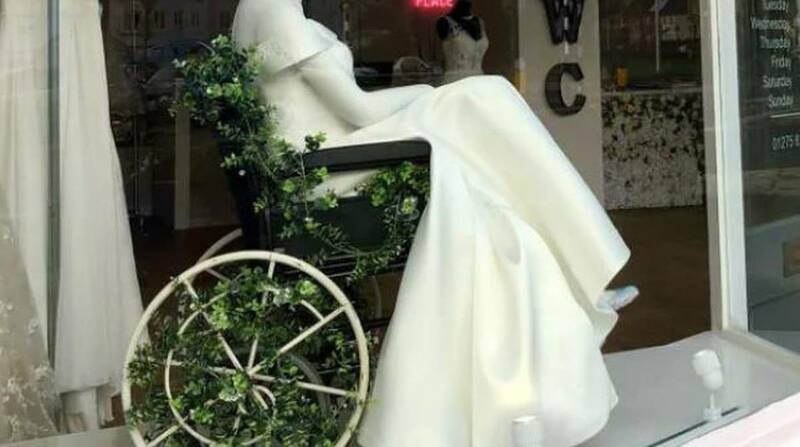 “The new wedding shop in town has a wheelchair using mannequin and it shouldn’t be exciting but it’s the first time I’ve ever seen disability portrayed in a shop window,” she said. A mannequin in a wedding dress, in a wheelchair decorated with flowers. One Twitter user emotionally responded to the post, saying: “As a recently engaged wheelchair user this bought tears to my eyes … I’ve put off looking at dresses because of the fear of it not working with my chair/it not being the whole ‘say yes to the dress’ experience. That while it’s great to see such a show of inclusivity, it is at the same time shocking that this non-prejudice view of fashion is so rarely seen. The store’s owner, Laura Allen told Today Style she’s happy the display has had such a positive response, particularly since it has replaced a much more elaborate display prior to the change. “We love the fact that it’s so simple compared to our window display before, yet it portrays such a powerful message of inclusion,” Ms Allen said. Along with hundreds of other commenters, one woman shared that buying a wedding dress as a woman in a wheelchair was “the most difficult and emotional element” of the whole process. She stressed that “wheelchair users love shoes too,” which is why she opted for a stunning pair of Jimmy Choo’s for her special day. Another user pointed out that while the display is “fab,” it would be even better if “more bridal shops showed this level of inclusivity”. While the fashion industry is an ever-evolving facet of our culture and expression, the reaction to this rare sighting has highlighted that there is still a long way to go in representing everyone inclusively.